SUPPOSE you were an up-to-date young wife who moved into an old and elegant New York apartment house with a rather strange past. SUPPOSE that only after you became pregnant did you begin to suspect the building harbored a diabolically evil group of devil worshippers who had mastered the arts of black magic and witchcraft. SUPPOSE that this satanic conspiracy set out to claim not only your husband but your baby. Well, that's what happened to Rosemary...Or did it...? The plot is pretty simple when it all comes out, but during the book the reader is given the impression it is not so straightforward. Around every corner a new doubt leaks into Rosemary's mind; different arrows point at different conspiracies that may or may not present. And then, of course, there is always the question of whether or not it's simply the case of poor Rosemary losing her mind. 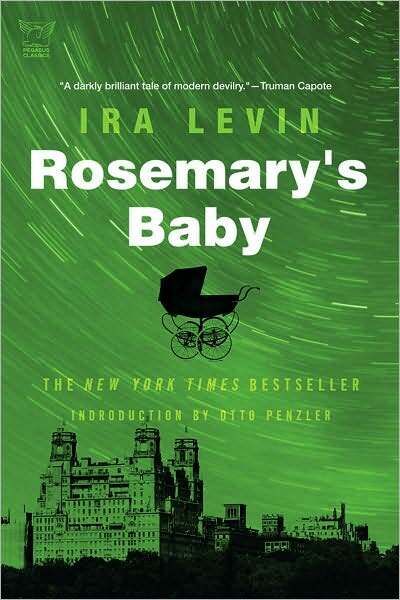 Ira Levin effectively stirs up an ideal sense of mood; isolation for the young pregnant woman in a constant upheaval of confusion; the feeling of being trapped as it seems no one believes her in the big bad world, and even the loved ones she has always trusted come into doubt. There are plenty of suspenseful moments throughout the novel, although not heart-stopping. The story moves at a quieter and more peaceful pace than many modern day horror tales, only to come around and unexpectantly bite you in the rear during the second half. 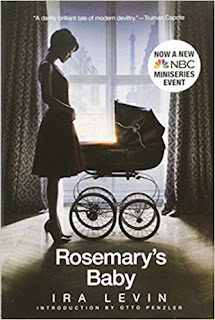 Rosemary, a typical housewife of the times, and her husband Guy Woodhouse, an aspiring actor waiting for his big break, make interesting characters the reader can relate to. The nosy neighbors are intrusive, but they're also not too different from many odd couples that live next door. All characters are explored in depth, giving us a sense of eerie reality, while the tale of horror is told only through the eyes of the main character. 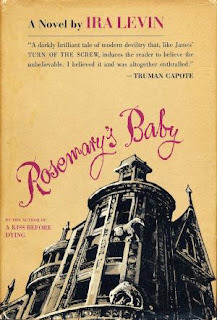 The pace of Rosemary's Baby is a bit slow but it doesn't deter from its purpose -- to horrify. I recommend giving the book a try if you can get your hands on a copy, for while it is very similar to the film version, reading about darkness and deception instead of simply "viewing" it can implant powerful stories even further in our minds. 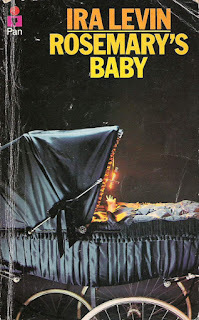 The movie is directed by Roman Polanski, whose pregnant wife, the actress Sharon Tate, was in 1969 murdered by Charles Manson and his followers, who titled their death spree "Helter Skelter" after the 1968 song by The Beatles, whose leader, John Lennon, who would one day live (and in 1980 be murdered) in the Manhattan apartment building called The Dakota - where Rosemary's Baby had been filmed.